Hotfoil-EHS specializes in electric surface heating systems. Applications include fly-ash hoppers on electrostatic precipitators, baghouses, coal and material handling systems, tanks, and pipes. For more information, contact Hotfoil-EHS by calling 609.588.0900 or visit https://hotfoilehs.com. Hotfoil-EHS, Inc. is an organization with over 70 employees and an impressive engineering capability. Through continued re-investment of profits, Hotfoil-EHS acquired additional large fabrication facilities and today is a full-service engineering, design, and manufacturing company of industrial heating equipment. Their Hamilton, NJ headquarters provides 68,000-square-feet of manufacturing space, with other manufacturing and distribution facilities located in Chattanooga, TN, LaPorte, TX, and Birmingham, England. Hotfoil specializes in electric surface heating systems for fly ash hoppers on electrostatic precipitators or baghouses, coal and material handling systems, tanks, pipes, etc. in all types of industry. A major hazard in coal burning utilities is the transfer and storage of coal due to the presence of highly combustible coal dust. Mitigating the risks of combustible dusts eliminate the potential for dust explosions. It is critically important that any coal handling or coal storage facility have access to experienced application engineers who understand the specific requirements when handling coal and managing coal dust. 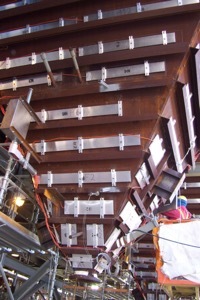 Electric heat is very often used to prevent coal freeze-ups in hoppers and conveyors. The most common electric heaters used are are exterior mounted panel heaters with carefully calculated watt densities to keep sheath temperatures low. A less preferred solution is the use of tubular heating elements that may have higher sheath temperatures. Tubular heaters are usually clamped or stud-welded to the exterior of the coal hopper or conveyor chute. In either case, a control system must be employed to maintain operating temperatures and to safely limit temperatures below dust ignition temperatures. Since the presence of coal dust in the atmosphere is considered normal, the use of explosion proof housings, conduit, and wiring practices is required for these control systems. 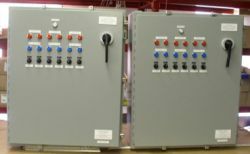 Hotfoil, a New Jersey manufacturer of electric hopper and coal handling heating systems, designs, engineers, and fabricates custom control systems specifically for these applications. With decades of experience in hopper, conveyor, and tank heating systems they provide their customers with a single-source, turn-key, electrical heating and control system solutions provider. All products are 100% quality tested prior to leaving the facility, and an added plus is that they provide on-site start-up assistance. Hotfoil-EHS specializes in electric surface heating systems in power plants for fly ash hoppers on electrostatic precipitators or baghouses, coal and material handling systems, tanks, and pipes. Fly ash is a by-product of coal fired and waste-to-energy fired electrical generating facilities. Fly ash is a combination of dust and fine particles produced during combustion. Environmental laws require fly ash to be collected and not released in to the atmosphere. Large collectors called electrostatic precipitators combined with a system of filters extract fly ash from the flue gas and dispense the fly ash in large steel hoppers prior to being dumped in to containers and transported. Due to the temperature differential between the hot internal temperature of the hopper and the cooler exterior, condensation forms on the internal wall surfaces, The condensation, combined with the fly ash, creates a concrete-like material that bonds to the hopper walls. The accumulation of this material eventually clogs the hopper to the extent it cannot be emptied. At this point, the only way to free the clogged material is with sledge hammers and pneumatic tools and long periods of downtime and the related expense. electric heaters are bonded or clamped to the exterior walls and throat of the hopper. Because the environment is normally very dirty with high vibration, “hopper heaters” are designed to withstand to meet these mechanical and environmental stresses. Hopper heaters come in a variety of physical sizes, voltages, and wattages. Most often, hopper heaters come in pre-engineered sets that have been specified and configured by an applications engineer. For more information on any hopper heating application, contact Hotfoil-EHS for a free consultation. Visit http://www.hotfoilehs.com or call 609.588.0900. Here's a short video showing Hotfoil's capabilities in engineering, designing, and applying hopper heaters and control systems used in power plant applications. All Hotfoil products are made in the USA at Hotfoil's Hamilton, NJ manufacturing facility. example of conductive heat transfer. Heat transfer is the movement of heat from one body or substance to another by radiation, conduction, convection, or a combination of these processes. When heating a pan of water over a gas flame for example, all three forms a heat transfer are taking place. Heat from the flame radiates in all directions. Conduction takes place with the transfer of heat from the burner to the metal pan. This heat transfer is also responsible for making the handle hot after a period of time. Water is heated by the process up convection which is a circular movement caused by heated water rising and cold water falling. The process of heat transfer also occurs when an object cools. If a mug of hot coffee is left standing on a cold kitchen countertop, its temperature will gradually decrease as heat is lost. The heat energy dissipates by conduction through the mug to the table top by convection as the liquid rises, cools and sinks, and by the radiation of heat into the surrounding air. One way to conserve the heat a liquid and prevent heat transfer is to place it in a thermos. The use a vacuum chamber with silvered surfaces, along with low conductive materials, can greatly improve the amount of heat or cold that is lost to the surrounding environment. In between the silvered glass walls up a thermos lies a vacuum. In the case of a hot liquid heat transfer by convection through the vacuum is greatly restricted due to the absence have air molecules necessary to facilitate the transfer of heat. The lack of physical contact between the inside and outside walls of the thermos due to this airless space also greatly inhibits the movement of heat by conduction. Heat loss by radiation is prevented by the silvered walls reflecting radiant energy back into the thermos. Some conduction of heat through the stopper in glass can be expected but this too is limited because they are made of materials with very low conductivity. Thus the temperatures are both hot and cold liquids can be maintained by a properly designed thermos that limits the transfer energy through radiation convection and conduction. Heat capacity is the amount of heat required to change the temperature of an object or substance by one degree Celsius. The heat capacity of water varies depending on its phase. As solid ice, the heat capacity of water is .5 calories per gram for every one degree Celsius, which means it takes half a calorie to raise the temperature of one gram of ice one degree Celsius. As a liquid, water heat capacity is one calorie per gram for every one degree Celsius, so it takes one calorie of heat energy to raise one gram of water one degree Celsius. The processes of phase change between solid, liquid, and gas also require a specific amount of heat energy. The amount of energy required to change a liquid into a solid, or a solid into a liquid, is known as heat of fusion. The amount of heat required to change one gram of ice to water is 80 calories. Similarly the heat vaporization is the energy required to transform a liquid into a gas. It requires 540 calories to change one gram of liquid water into a gas. With these values its easy to calculate exactly how many calories of heat energy are required to transform one gram a ice at absolute zero to steam. To warm 1 gram of ice from -273 degrees Celsius to 0 degrees celsius would be 273 times .5 gram per calorie or about 140 calories. The phase-change of one gram a ice to liquid water requires 80 calories. Then to heat the water from zero degrees Celsius to 100 degrees Celsius with the heat capacity at one calorie per gram, would require 100 calories. The final phase change it one gram a boiling water to steam would require an additional 540 calories. Adding all of these values together yields 860 calories, the amount of heat energy it takes to transform one gram gram of ice at absolute zero to steam. Pluggage of flyash collection hoppers due to flue condensation is an expensive and unnecessary problem. Type HB Heating Module systems are specifically designed to eliminate the maintenance nightmare of hopper pluggage. The HB Heating Module system is designed to provide low watt density heat spread over the maximum surface area available for heating. Uniform heating is essential to avoid cold spots, especially near the hopper throat where fly ash pluggage is most prevalent and problematic. To obtain maximum heater coverage, both rectangular and trapezoidal heaters are available to provide the most effective and efficient application of heat. 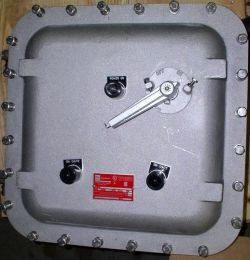 Most flyash hoppers are designed with poke tubes, manways, and cylindrical throats. As supplemental equipment we can include custom built flexible heating blankets for these problem areas which become integrated with the HB Module system to provide the ultimate in uniform heat distribution. Electric Heating Systems for Power Industry Baghouse and Precipitator Hoppers from Hotfoil EHS, Inc.
Hotfoil-EHS is committed to educating and training users of our products, namely electric hopper heating systems, electric pre and post weld heat treating, heat treating furnaces, and multi-operator welding stations. In future posts, we hope to provide interesting information for a wide variety of applications, performance, and products for the markets we serve. Coal and Fly Ash Hopper Heaters, Industrial Tank Heaters, Heating Cable, Silicone Heater Blankets, Control Systems. Pre & Post Weld Heat Treating Power Consoles, Ceramic Mat Heaters, TAU Units, Temperature Recorders, Cable Sets, Brinell Testers. 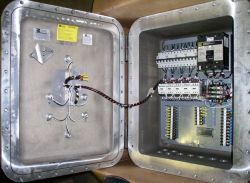 Multi-Operator Power Supplies, Packaged Welding Systems, Single Operator Welders, GRID Systems, Custom Transformers.